Every kid loves to have their face painted, and children from all over mid-Michigan have had the pleasure of meeting Sharon Shutes, the incredibly talented face painter at Lids for Kids in Lansing. 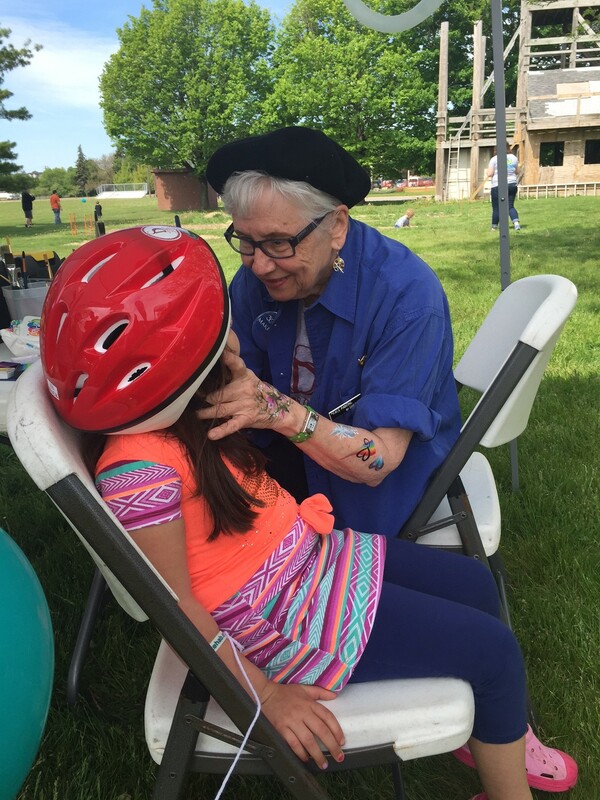 We recently had a chance to speak with her regarding her involvement with the bike safety and free helmet event and are so glad she will be painting away once again this year. Hi, Sharon! Can you tell our readers a little about yourself? I was born and raised in Michigan. I worked at Sparrow hospital for many years, and when I retired I wasn’t sure what I would do. It took me a little bit, but then I discovered face painting. I’ve been doing it for twelve years now and love it! Tell us about how you first got into face painting? In 2006, I took my family and young grandchildren to the Sparrow family picnic. There was a really long line of kids waiting for face painting and I thought to myself, “I could do that!” I’ve always been somewhat crafty, so I took a face painting class and began volunteering right away at my church, Sparrow events, and family parties. Eventually, I started a side business face painting at several festivals per season. Now, festivals are about a third of my overall work. After that first class, I connected with a business owner and fellow face painter in Portage, Michigan. I buy all of my face painting supplies from that store. Each year, I take another class so I can continue improving my skills by learning new techniques. I love to learn, so it’s exciting to do something new every season. I even have a quick design for very little kids who might have a difficult time holding still. How did you first become the face painter at Lids for Kids and how long you’ve been doing it? This summer will be my third year as the face painter at Lids for Kids. My granddaughter, Courtney, is a paralegal at Sinas Dramis Law Firm, who sponsors the event. She is how I first learned of Lids for Kids. She thought face painting would be a great addition, and I was happy to volunteer my time. I had no idea it was such a huge event with so many children and families! I love spending extra time with Courtney and giving back to the community. Finally, what is your very favorite thing about Michigan? I love how much there is to do in this state, and that you don’t have to travel very far because Michigan has it all. I also really enjoy the changing of the seasons. You don’t get to experience that everywhere like you do here. We can’t wait to see all of Sharon’s beautiful artwork displayed on little smiling faces at this year’s Lids for Kids in Lansing! We hope you’ll join us on Saturday, May 19 at the Marshall Street Fire Station.